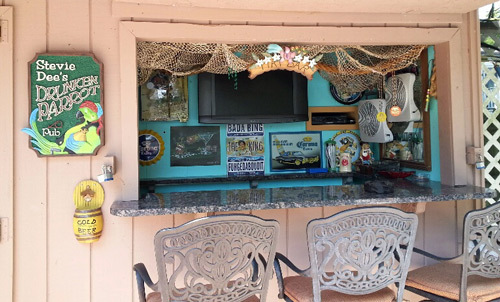 Have you ever wondered how to find someone who cares and has the skill to make a customized bar sign? A sign that feels like it was made just for me, utilizing my ideas and unique bar area? There’s no need to fear, Old West Signs exists to do just that, and we have 75 years of experience creating unique and custom bar signs for hundreds of satisfied clients. We have clients from all walks of life, with a variety of interests and located all over the world. Second to crafting the perfect sign for our customers, there’s nothing we enjoy more than brainstorming ideas about the custom sign you’ve been dreaming of. Finding a sign that reflects your inner self and goals is rather difficult in this age of screen printing and bulk sign assembly line fabrication. You need a team that understands your thoughts and desires and can bring those ideas to life. We work with clients just like you every day to pull the ideas out of your head and get them on to paper to build the perfect sign. After all, it’s not just what the sign says and the text that you use that makes your customized bar sign special. It’s the feelings that it invokes and the fun that people have when they encounter it for the first time. You’re designing and crafting experiences, not just creating a sign, and there’s nobody that understands this point better. 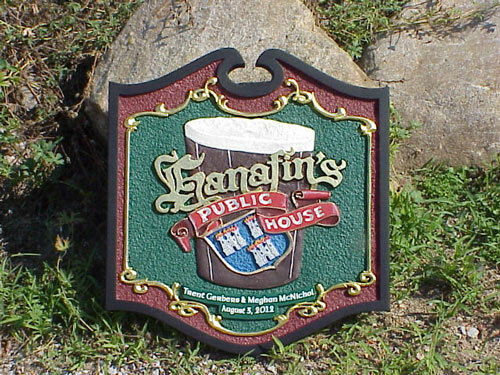 We pride ourselves in creating “one of a kind” customized bar signs. We make signs from a variety of materials to achieve a specific look and feel. 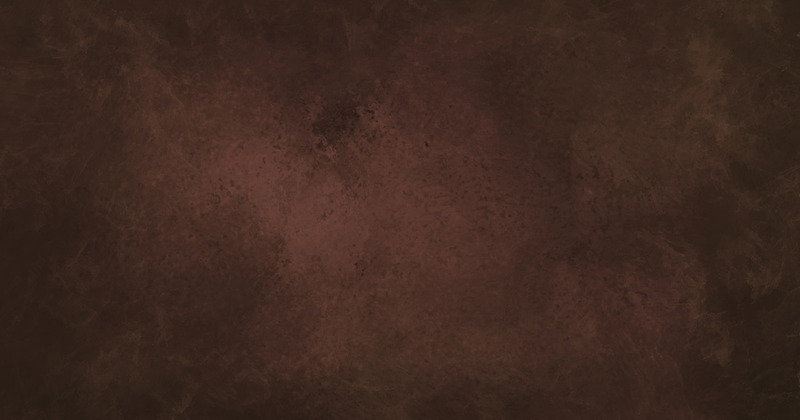 We use everything from aged barn wood to space aged urethane and everything in between to bring your design to life. Our goal is to make a long lasting statement to your friends and family visiting your bar. Maybe you’re envisioning a 3D hand carved beer mug with frothy foam spilling over the side. What about an “old west” saloon sign from the Western Movie era? 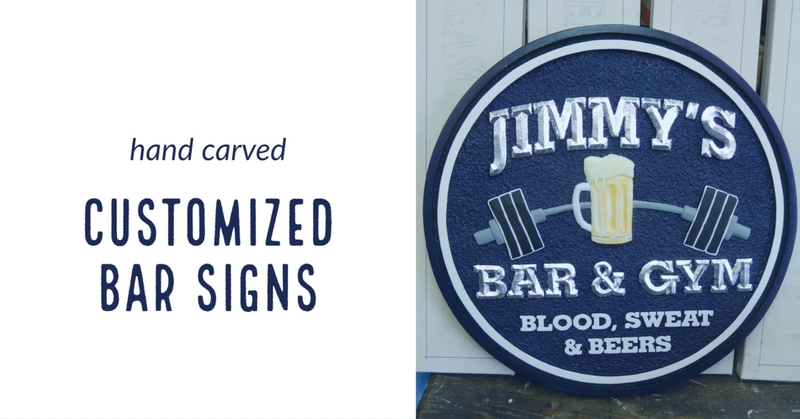 Want a family crest that you designed on the back of a bar napkin placed in a custom bar sign? Maybe you’re hoping to take that photo of your family pet and carve it into a sign. We’ve done it all! Want a historic reproduction sign from a historic English Pub? Want a sign with a thirsty lizard drinking a beer? There’s no limit to what we can bring to life for your bar or pub sign. 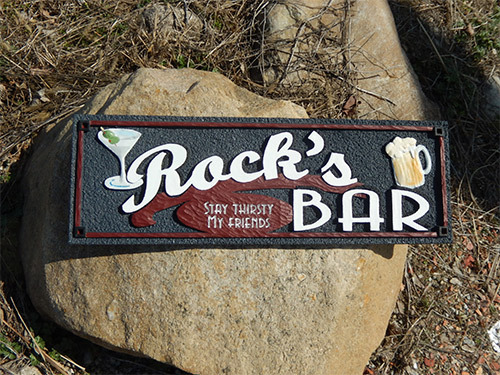 Whatever you can imagine, our team can design and craft your customized bar sign. With hundreds of satisfied clients, we’re ready to start your custom bar signs into production. We get calls from all over the world, and we take the time to work through every detail from beginning ideas to installation of the sign of your dreams. Here’s a recent example of a satisfied customer, and a sign we’re exceptionally proud of. We received a call from Brooklyn, N.Y. where a client wanted a backyard Caribbean themed bar sign. 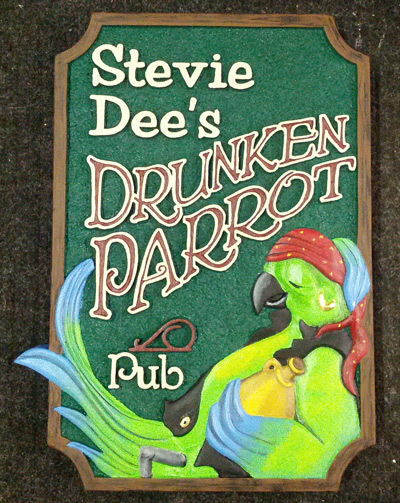 We started with an initial idea, and through a few emails back and forth, we were able to create the sign for Stevie “D”s Drunken Parrot Saloon. Stevie D’s sign is hand carved, hand painted and an absolute one of a kind creation. Our drunken parrot is now the centerpiece of an incredible backyard bar where I would be privileged to down a pint. 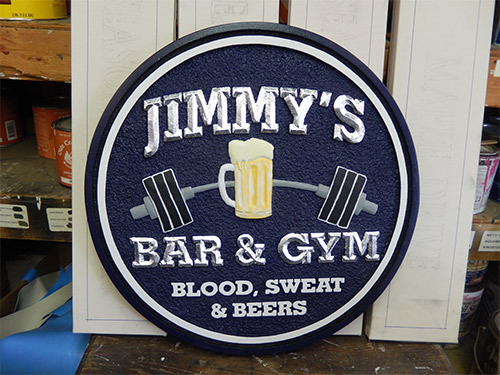 Are you looking for the perfect custom bar sign? There’s no time like the present to reach out and create something together. Drop us a line by filling out the form below and let’s bring that sign of your dreams to life.